I'm thrilled to be part of the blog tour for I'm My Own Dog by David Ezra Stein. Peanut and I had fun reading this book and then generating questions for David. He thought it was pretty cool that he got to ask the author questions. I love the questions his seven-year-old brain came up with. Here's us...see how much fun we were having? Peanut: What's your favorite color? David: Gold. Sapphire! Topaz. Lapis lazuli. Really dark purpley velvety. Um…I guess there are a lot. Peanut: Do you have any pets? David: We had a lot of unwanted mice in our apartment. But then we plugged up all the holes. So, I don’t think we have any pets now. I have a cat who doesn’t live with us because my son is allergic. Too bad for the cat; he would have loved all those mice. Peanut: Who was your favorite author growing up? David: So many. Arnold Lobel, James Marshall, Lloyd Alexander, A. A. Milne, the Sesame Street writers, Bill Watterson, Herge. Many more. Peanut: Besides any book that you made, what is your favorite book? David: Maybe Peter and Wendy by J. M Barrie. It’s hard to choose just one. Peanut: Why did you think of this book about a dog and not about another animal? David: I always imagined this story as being about a dog. It could not be about any other animal. Dogs are so close with people. This dog believes that he doesn’t need anyone’s help in his life. Most dogs do have a person in their lives. So I think when you read the book, you feel like someone’s missing until, bam! The man shows up. David: Maybe you could write some more adventures for the dog and the man! Thank you to David and Candlewick for inviting us to be part of the blog tour, providing a copy of the book for us to review and a copy to giveaway! to hear what they think of I'm My Own Dog! 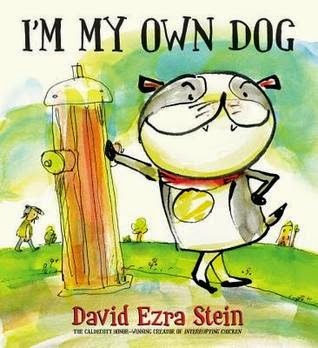 GoodReads Summary: Caldecott Honor winner David Ezra Stein has fans at his command with this comical dog’s-eye view of having a best friend.